This booklet gives a straightforward explanation of how a person can be saved through faith in Jesus Christ. A useful tool for witnessing to those who wish to know how to get to heaven. First, there’s full, complete, and eternal pardon for every sin. That’s wonderful, but that’s only part of it. God also freely gives everlasting life, mansions in the skies, adoption into His family, communion with Himself, rewards for service, and in fact “all things” to those whom He saves. That is such good news, because everyone desperately needs to be saved. All have sinned and deserve punishment. There is not one single person in the whole world free from sin. This includes you too. But there is salvation! And there is salvation for you! That’s what you’ll find explained in this booklet. While the way of salvation should be clear and plain, unfortunately there is confusion in the minds of millions as to how to be saved. Multitudes are trying to be saved in their own way while ignoring God’s perfect way. To miss God’s way is to perish eternally. How marvelous that the God of the Ages should have a way for us! He has looked after all the details. There is nothing left out. His way is complete, foolproof—perfect. It’s so important that you know God’s way. The following pages use sharp contrasts to explain God’s way of saving sinners. Read them with an open mind and an open heart. Not Your Work for God, but God’s Work for You! The truth simply is this: It just isn’t possible for you to be saved by what you do for God. If you are of good moral character, that will not help. You may be educated, gifted, wealthy, successful, respectable, honored, but God accepts nothing in return for the gift of salvation. Good deeds can’t purchase pardon either. Not giving money to worthy causes, not volunteering for charities. You may do the very best you can, but the works of men’s hands can never merit salvation. “He saved us, not because of works done by us in righteousness, but according to his own mercy” (Titus 3:5). “We have all become like one who is unclean, and all our righteous deeds are like a polluted garment” (Isaiah 64:6). What then? How can one be saved? Listen carefully: The essence of salvation is that it’s God’s work for you. It’s all provided for. The entire price has been paid. It’s offered on one simple condition: that you take it as a free gift from God. We couldn’t earn it or merit it in a million eternities. Therefore, God freely gives it to us. “For by grace you have been saved through faith. And this is not your own doing; it is the gift of God, not a result of works, so that no one may boast” (Ephesians 2:8, 9). Not a New Leaf, but a New Life! There are some who have promised God they will do better. Under stress of trouble or sorrow many have sincerely determined to forsake their sins and turn over a new leaf. But this is not the door to salvation. Even if the new leaf were kept unspotted—what about the other soiled days and years? God’s salvation is deeper than mere reformation. It’s an absolutely new nature. It’s a complete reckoning with all the past and an ironclad guarantee for the future. It’s not washing of the hands—it’s the gift of a new heart. “Everyone who drinks of this water will be thirsty again, but whoever drinks of the water that I will give him will never be thirsty forever” (John 4:13, 14). Be assured that God is not interested in patching up your old life. What He wants to do is to give you a completely new nature, part of His own nature. For this new nature is destined to live forever in eternity’s heavenly glory. It’s completely new, fresh from the hand of our Creator God. Not Going to Church, but Being a Christian! This is so important. It is true that the Church is God’s divinely appointed institution in today’s world. But salvation is not by the Church. You may attend the services regularly, sing the hymns, listen to the sermons, drop your gifts in the collection basket, join in observance of the Lord’s Table, even join the Church—but these things will never save your soul. Don’t misunderstand. These things are right and good for all Christians to do, but we’re talking about how to become a Christian. Don’t mistake church privileges and duties for the door to eternal life. Many people have been saved in church, but not by the Church. Christ alone can save. “Believe in the Lord Jesus, and you will be saved, you and your household” (Acts 16:31). It is true that the main duty of the Church is to proclaim Christ and His gospel. But it is Christ and Christ alone who saves. One must have a personal, individual, actual transaction with the risen Son of God. The Church is the body of Christ. But in the matter of salvation, we’re saved by the Head. “Christ is the head of the church, his body, and is himself its Savior” (Ephesians 5:23). “He is able to save to the uttermost those who draw near to God through him” (Hebrews 7:25). Not Keeping the Law, but Love Keeping You! Are you trying to be saved by keeping the law? Do you expect to enter Heaven by the observance of the Ten Commandments? Would you be amazed if you heard that no one in all the world has ever been saved that way? While the law is just, holy, and good, it is not a means of salvation. Its purpose is to show you your inability to be righteous before God. It is a means of condemnation. “For by works of the law no human being will be justified in his sight, since through the law comes knowledge of sin” (Romans 3:20). “No one is justified before God by the law, for ‘The righteous shall live by faith’” (Galatians 3:11). Not in ceremonies and washings, not in keeping the Sabbath, not in refusing to eat certain foods, not in pilgrimages to holy places, not in burning candles, not in paying a tithe of one’s income. Salvation is not in these acts. The law condemns (that’s its purpose), but Christ saves those whom the law condemns. The law is a mirror to show man’s need, but the blood of Christ cleanses us from all sin. Salvation is not to be found in “keeping.” The Christian is “kept” by God. “The law was our guardian until Christ came, in order that we might be justified by faith” (Galatians 3:24). “You are not under law but under grace” (Romans 6:14). Not by Water, but by Blood! Baptism in water is one of the two great sacraments of the Christian Church. It is a divinely given ordinance to mark the Christian’s inseparable union with Christ in death and resurrection. Never, however, is it a means of salvation. There is no soul-cleansing in water. Sin can only be cleansed by blood. “Without the shedding of blood there is no forgiveness of sins” (Hebrews 9:22). “In him we have redemption through his blood, the forgiveness of our trespasses” (Ephesians 1:7). “You were ransomed… not with perishable things such as silver or gold, but with the precious blood of Christ” (1 Peter 1:18– 19). Every Christian ought to be baptized, but not until he or she has been genuinely saved. Baptism is a testimony to the believer’s own heart, to the church, and to the world that his or her faith and trust are in the finished work of Christ on the cross. It is a symbol of that change which has already taken place in the Christian’s life. “So those who received his word were baptized” (Acts 2:41). “And many of the Corinthians hearing Paul believed and were baptized” (Acts 18:8). Some have complained they don’t “feel” saved. But salvation must first be a fact before it is a feeling. Never does God work from feeling to faith—always the opposite. Our redemption rests upon the absolute certainty of God’s Word, not on our own experience. We are saved on the simple basis of taking God at His word. God offers to sinners all the benefits of incomparable salvation on the one condition that we believe Him. At the moment we reach out by faith and trust in God, all the things which God has promised become eternally true. Feeling will come in time. As you grow in your faith you will begin to “feel” saved. Christ will become more real, and prayer and Bible reading more blessed. But entering the Christian life is different. This step is taken not on the quicksands of uncertain feeling, but on the surety of the Rock of Ages, Christ Jesus. “‘What must I do to be saved?’ And they said, ‘Believe in the Lord Jesus, and you will be saved, you and your household’” (Acts 16:30–31). Suppose you try to do the best you can. Is that enough? Suppose you strive to make your life upright and exemplary. Suppose you endeavor to perform noble deeds. Let’s say your motives are high and unselfish. Will you be surprised to hear that God simply does not save on the basis of man’s trying? God’s standard of life is absolute perfection. He will never receive anything short of that. No one will ever be in Heaven except those who fully qualify here. And the truth is that only one Person in all the world ever lived an absolutely sinless life—Christ. All else have terribly failed. If salvation were by trying, no one would ever be saved! “For by grace you have been saved through faith…not a result of works” (Ephesians 2:8–9). The heart of salvation is substitution. Christ took our place. He lived perfectly, never sinned, and when He died, He died for us. He became our substitute. He takes our sins; we take his righteousness. Thus we can stand before God clothed in robes of perfect righteousness by simply trusting in the finished work of Christ. That’s the good news of the gospel. Not by Our Methods, but God’s Miracle! Methods employed in gospel meetings are intended to be an aid to the sinner’s acceptance of Christ. But the methods in themselves are not a basis for salvation. Raising one’s hand for prayer, going forward to the altar, signing a card, or shaking the hand of the evangelist may help in the all-important decision, but there is no salvation until the sinner meets the Savior. Saving your guilty soul is God’s greatest miracle. For in doing so, He righteously removes your sin and in all justice pardons your guilt. No one in all of time or eternity can ever question the validity of your redemption. But the key to the entire matter is the sacrifice of Christ. To trust anything but Him is to entirely miss the mark. “You search the Scriptures because you think in them you have eternal life; and it is they that bear witness about me, yet you refuse to come to me that you may have life” (John 5:39, 40). There is nothing wrong with methods if they point to Christ. The danger lies when it is not clearly explained that not only must you raise your hand, but you must open your heart. Not only must you come forward to the altar, but you must come to Christ. Shaking the hand of the evangelist must indicate that you forever place your hand, heart, and life in the pierced hands of the Savior. For it is when the guilty sinner meets the Savior of sinners that God’s mighty miracle takes place. Not Head Knowledge, but Heart Belief! Some have argued that they have always accepted Christ. But you don’t believe in Christ like you believe in Julius Caesar or George Washington. Christ must become to you more than a mere figure of history. When you receive Him it must be with more than intellectual assent. To be saved, Christ must be the greatest, nearest, and dearest Person in your life. It is true that Jesus Christ is the greatest Man in history. But He is more than that—He is the God-Man. It is also a fact that He lived a life of wonderful example. But that isn’t enough either. His life was absolutely, sinlessly perfect. You may accept the truth that He died innocently and sacrificially, but until you see that He died for you, personally, you cannot know salvation. “And his name shall be called Wonderful Counselor, Mighty God, Everlasting Father, Prince of Peace” (Isaiah 9:6). “He is the radiance of the glory of God and the exact imprint of his nature, and he upholds the universe by the word of his power. After making purification for sins, he sat down at the right hand of the Majesty on high” (Hebrews 1:3). Please understand that salvation is never yours on the basis of your acknowledgment of the Jesus of history. To be saved, one must personally receive the Christ of Calvary. You must place your entire trust and faith in Him. Not Your Anything, but God’s Everything! Sincerity does not constitute salvation. The man who is sincere yet wrong is just as lost as the hypocrite. God demands that you be both sincere and right to be saved. To depend upon sincerity is to die in your sins. Nor is repentance synonymous with salvation. Repentance is sorrow for sin and often leads to salvation. But it is never enough to be sorry for sin. Tears will never cleanse a guilty heart. Only Christ’s blood can do this. Being under conviction is not salvation. Conviction of heart is often God-sent and may lead one to the realization of his or her desperate need. In this way conviction may become an arrow pointing to Christ, but salvation takes place when the convicted one rests his all in an all-sufficient Christ. Nor is confession of sin salvation. Confession is a healthful exercise and can lead to the blessed experience of having your transgressions pardoned. But confession of sin must lead to a definite, actual, personal trust in the crucified and risen Christ before salvation occurs. Denial of sin will not change the fact, nor a routine affirmation of the goodness of God. It is true that God is love, but God is also righteous, just, pure, and holy. And God hates sin with a holy hatred. No sinner can ever stand in His presence. Thus the necessity of the acceptance of the sinner’s substitute, Christ. By Him sin is forever banished, and the sinner is forever saved. Salvation is Christ, receiving Him in your heart. With Him you’re saved. Without Him you’re lost. 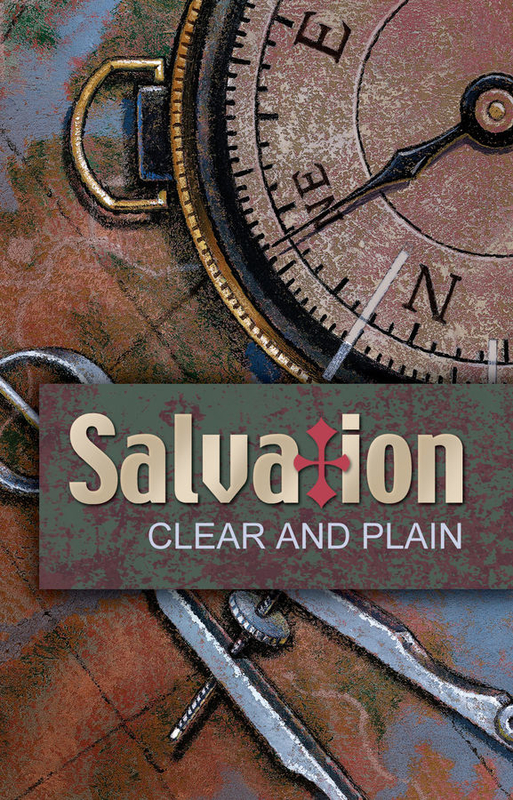 What does salvation mean for me? What then is our part in salvation? If being saved is God’s miracle, if Christ has fully paid the price, what does the sinner need to do in order to receive the incomparable benefits of salvation? Here is God’s truth. The whole matter of our responsibility has been gathered into one all-inclusive term—we are told to “believe.” We are to believe God. Believe what He has said about us, that we’re hopelessly lost in trespasses and sins. Believe what He has said about His own dear Son, that He is abundantly able to save to the uttermost. We are to believe so completely that we gladly rest our life and our eternal destiny on the Word of God. Believe means to receive. Salvation is so great and costly it could never be earned. So God freely offers it to guilty sinners as a gift. We believe, when by faith, we reach out and take it. Believe means to trust. Trust our past, present, and future to Christ. Surely He is worthy of our trust. Everything that comes into our lives is to be entrusted to Him. Believe means to accept. To open the door of your entire being and invite the Lord Jesus to enter. To take Him for a blessed and wonderful Companion all the days. Believe means to turn. To turn from following your own will and way to following God’s will and way. To turn from seeking your own advancement to advancing the cause of Christ. Believe means to rely. To depend upon the Lord Jesus for every need. To find Him abundantly able to meet every problem. To have Him as your very own. Are you ready to believe? Are you willing for God to accomplish in your heart the miracle of the new birth? Will you here and now trust the peerless Christ? Will you open the door of your heart and receive Him—forever? God is ready to receive you. And here is the basis of your approach to Him: You are a lost sinner, worthy of death and under the condemnation of a righteous God. But Christ has died, not only for the sins of the world, but for your sins. And God freely offers to forgive all your sins and gladly bring you into His family if you will receive His dear Son. Dear God, I come to You as a lost sinner, for Your Word says that all have sinned and fall short of the glory of God. But I thank You that Christ died for me, and that whoever believes in Him will not perish but have eternal life. I come to You believing in Jesus Christ as my own personal Savior and receiving Him into my heart. According to Your Word, cleanse me from all my sins and make me Your child. I pray this in Jesus’ name. Amen.